You might not have ever even thought about it, but trees play some important roles in Disney World. Going back to the beginning of Disneyland, it was important to Walt for his parks to have ample green space giving the park not only a clean feel but a colorful look. He also wanted the trees to be as close to full scale and mature as possible, so they built a Walt Disney World Tree Farm. These trees are out of sight of the average Disney World visitor, but there are a massive amount of trees here equating to about a third of what’s in the park. Trees here are grown and groomed to be similar in size and shape to the trees on stage so if anything is damaged, it can be replaced overnight without any guests noticing. 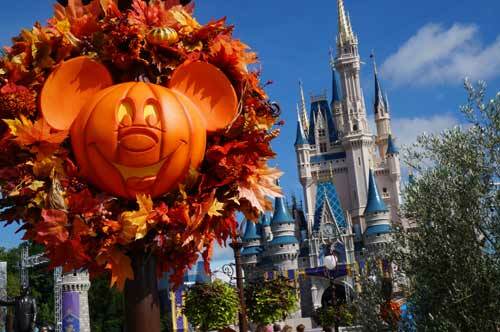 Let’s take a look at how these trees, shrubs, and other plants are used in Disney World. The Florida climate can be pretty harsh. Summers are hot, humid, and often wet while temperatures can drop into the 30s on cold winter nights. Not only that, but Florida has been the victim of nature from hurricanes and thunderstorms to a variety of hungry insects. Trees provide shade and shelter in Disney World. Trees planted in Disney World have to stand up to all of these things, plus they have to provide shade and shelter for guests who also have to endure the weather in Disney World. When it rains, large trees provide shelter from the elements; when it’s hot, the trees help to shade hot guests from the intense sun. What’s more, the animals in Disney’s Animal Kingdom also use the trees for shade and shelter. Throughout the years, Disney Horticulturalists experimented with various species of trees to find ones that were capable of surviving and thriving in Florida, and they eventually found some good ones. 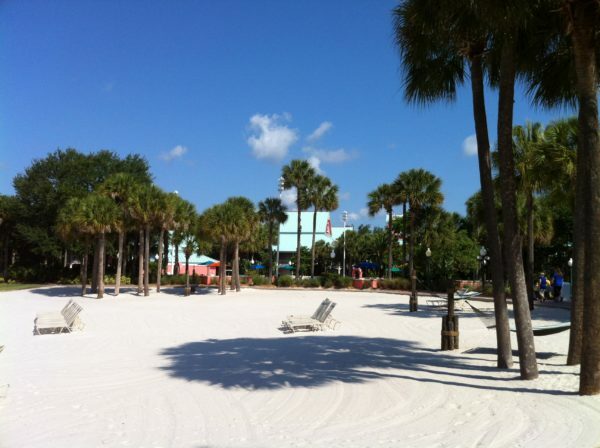 Today, over 4,000 acres of the Disney resort hotels, the theme parks, water parks, golf courses, and other public areas are landscaped by a team of 600 Cast Members maintaining these areas of shade and shelter. Disney World is a beautiful place thanks to this team of Cast Members who make it so, but there are some specific trees that contribute to the beauty of the parks in specific areas. This is especially true in World Showcase where authenticity is paramount. Many of these trees are not normally found in Florida, and Imagineers had to work hard to make them fit. There are Dawn Redwoods in Canada, Linden Trees in France, English Hawthorns in United Kingdom, Cypress Trees in Italy, and a Weeping Mulberry tree in China outside of Nine Dragons that was originally from an estate in New Jersey. These trees help beautify these areas and contribute to the authenticity of the pavilions. Trees also make the parks and resorts beautiful and authentic. While these trees are native to these areas and make the pavilions look good, there are some trees that have some pretty cool stories behind their journey to Disney World. The Yucca Tree in Mexico outside of Cantina de San Angel is more than 250 years old and was transplanted from the Chihuahuan Desert located between Texas and Mexico. Olive Trees in Italy are more than 100 years old and are from Sacramento, California. While Olive Trees can grow in Florida, they grow much larger in California and Italy, so the ones in this pavilion were transplanted from California. However, they had to be trimmed to transport them across the country, so if you look at them today the darker bark is original while the lighter bark is regrowth. The Oak Trees in American Adventure were found in the 1960s where Disney Springs stands today. They were moved to the Tree Farm where they were nursed and kept until Epcot opened in 1982. Finally, there is a Kukui Nut Tree at Disney’s Polynesian Resort, the only of its kind in Florida. It is native to Hawaii and is actually a significant part of the state’s history and present-day. Historically, the Kukui Nut tree was used for canoes, the seeds were used to make candles, and the nuts were used to make dyes for tattooing. They were also important to natural medicine and hygiene for shampoo, oil and lotion, and medicine. Today, the Kukui tree provides food, and the nuts are used to make jewelry and leis, which are meant to last much longer than the traditional flower leis. Finally, the towering palm trees that line the streets in Disney’s Hollywood Studios make the park as beautiful and authentic as the streets of Hollywood itself. 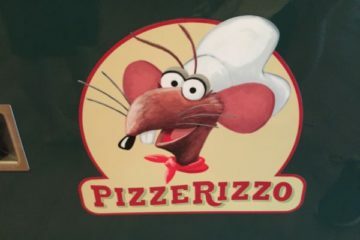 Disney is a master of removing you from the outside world. Still, backstage areas are required to transport people and goods quickly around the massive resort. It’s important that guests don’t see these areas. 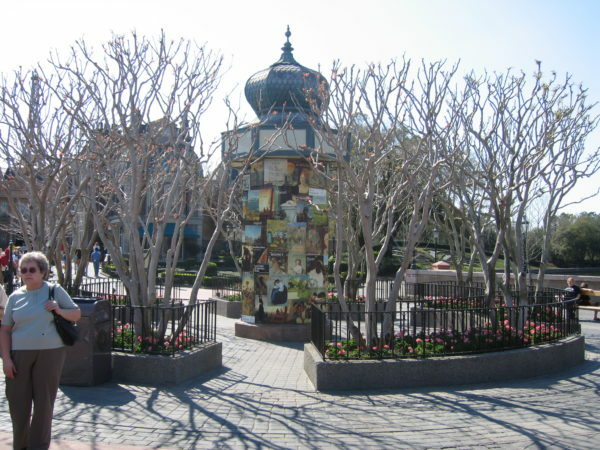 Disney strategically places trees, plants, and shrubs to hide backstage areas. Continuing the idea that trees help with immersing guests in the story, trees also help to tell the story of the land that you’re currently in. Jungle Cruise in Magic Kingdom‘s Adventureland holds trees that were never meant to be in Florida, but they have to be there to tell the story of an exotic jungle in the Amazon. The cacti in Frontierland aren’t native to Florida, but they’ve been nurtured to survive even in the cold. In Liberty Square, the Liberty Tree represents a tree by the same name in Boston that served as a gathering place for the Sons of Liberty in Colonial America and played a significant role in historical events like the Stamp Act Protests and the Boston Tea Party. The tree in Magic Kingdom is a Southern Live Oak and is more than 100 years old. 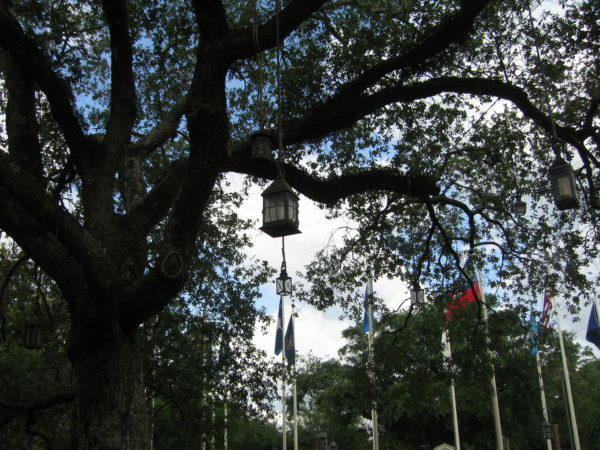 The Liberty Tree plays a significant part in the history of America, and it’s only proper that is hold a prominent spot in Liberty Square, which is themed as Colonial America. Finally, the Florida Sunshine Tree stood in the back of Sunshine Tree Terrace for years. It was a staple in the park’s early days as was The Little Orange Bird, who was designed by the Walt Disney Company and used to market orange juice for several years. 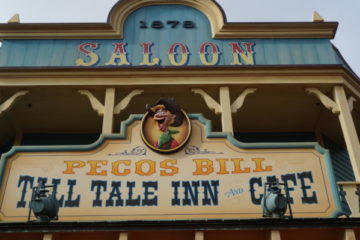 The Orange Bird helped with the story telling of the restaurant, but it also helped establish a kind of mascot connecting Florida to Disney and vice versa. 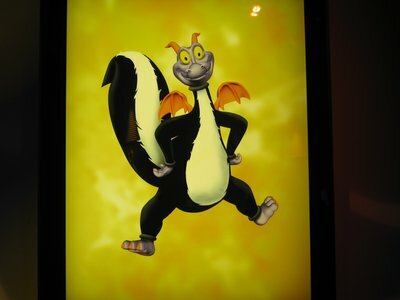 He appeared in the real world and in the fantasy world of Disney World, something that hardly ever happens. Some trees in Disney World are fake, but they’re so well designed and such a part of fabric of Disney World that we forget that… or maybe we just don’t care. The Swiss Family Treehouse is one such attraction. It is 70 feet tall, 80 feet wide, and weighs 150 tons. It’s made of concrete and reinforce steel, and there’s nothing natural about it. 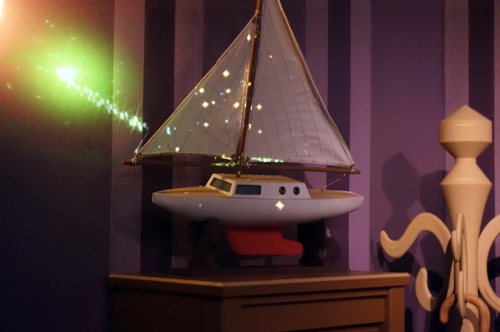 The attraction itself is based on the 1960 movie, Swiss Family Robinson, and is a walk-through where you can see rooms based on the movie including some items there were apparently salvaged from the 19th century shipwreck from which the family fell victim. Nearby also in Magic Kingdom is Tom Sawyer Island. This island in Liberty Square is actually only accessible from Frontierland by raft, which crosses the Rivers of America where the Liberty Belle sails throughout the day. On the island, you can hear forest sounds like animals, trees rustling, and other natural ramblings. Most of these sounds are engineered and played from speakers hidden within artificial tree stumps. Tree of Life becomes quite beautiful at night! The Tree of Life in Disney’s Animal Kingdom is a 145-foot tall structure based on the baobob trees of Africa. The tree itself is engineered from a refitted oil platform and features 325 carvings of animals both familiar and extinct. Inside the Tree of Life is a 400 seat theater showing It’s Tough to be a Bug in 4D, which is based on the Disney*Pixar film, A Bug’s Life. 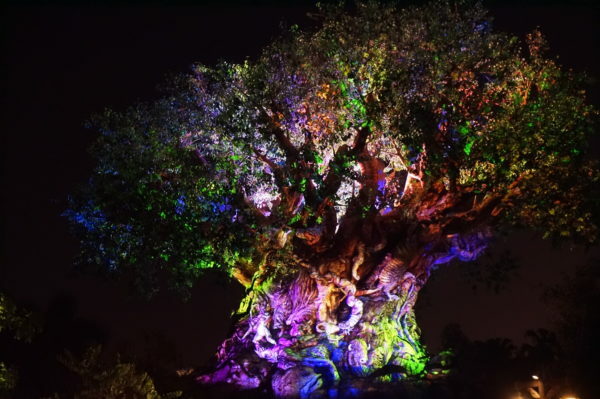 When Animal Kingdom began opening at night, Imagineers transformed Tree of Life into a nighttime version using projection-mapping technology. When the sun goes down, the Tree of Life glows brightly during Tree of Life Awakenings. 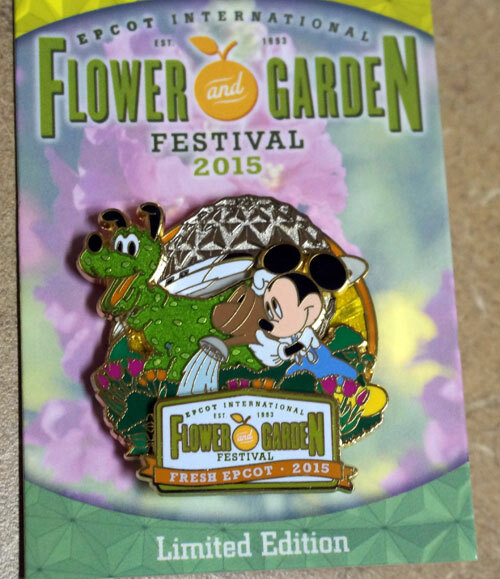 Do you enjoy the trees and plants in Disney World?